Presentation on "“Yellow Fever-This is an alarm bell for India". Dengue fever takes lives of 55 persons in three years in Kerala. A total of 18,883 cases have been reported from 14 districts til the month of June, 2014. 10 deaths and 7,760 cases due to dengue have been reported from May 2011 to May 2014. No deaths have been reported from Kozhikode and Wayanad districts of Kerala but 310 dengue cases and 104 dengue cases have been reported respectively from the two districts. 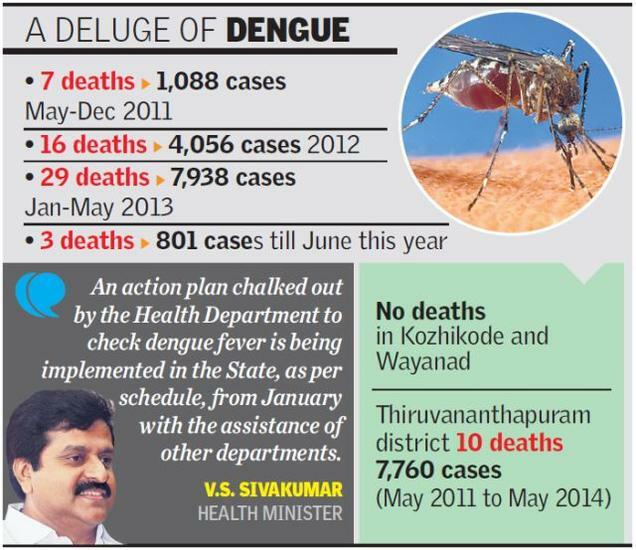 The number of dengue fever cases and deaths was on the rise in Thiruvananthapuram since May 2011. But no death due to dengue fever had been reported in 2014 up to June although 410 dengue cases had been reported. In May-December 2011, the capital district recorded only one death due to dengue fever and 711 cases. Dengue fever claimed 4 deaths during January-December 2012 while 2,447 cases were reported. In January-May 2013, five deaths due to dengue fever and 4,192 cases were reported from the district. In 2014, three deaths due to dengue fever and 801 dengue cases have been reported till June. The deaths due to dengue fever this calendar year had been reported from Kollam, Idukki and Thrissur districts of Kerala, India K. Radhakrishnan, Minister for Health V. S. Sivakumar action plan chalked out an action plan by the Health department to check the dengue fever on in the State from January and other departments have been assisting in this effort.